Ship burial is an ancient Germanic ritual which is most popularly known as the burial method for Vikings of particularly high status. However, almost all Germanic cultures performed this ritual, which often involved the construction of a ship to serve as a tomb for a body. Sometimes, the body was simply interred in the ship. Other times, the body was placed inside and the vessel was set on fire to cremate the corpse of the person being honored. Such burials are being unearthed all the time using new technologies to detect the ships. Most ship burials are mysteries when they are first unearthed because the ship itself (at least the wooden frame) is almost never intact. Believe it or not, only three well-preserved ships have ever been found in Norway. However, under a market square in Trondheim, Norway, one such ship was uncovered. Though no wood remained, nails and other metal parts that would be found on a 1,000-year-old boat were present at the scene. It became clear that this was a ship burial. Also excavated were bone matter and other materials. They were DNA tested and are believed to be human. A sheet of bronze was pressed up against the skeleton along with other burial keepsakes. There was also a key to a small box buried with the skeleton. These were religious rites for the Germanic peoples for centuries and served a deep and meaningful purpose of honoring the dead. 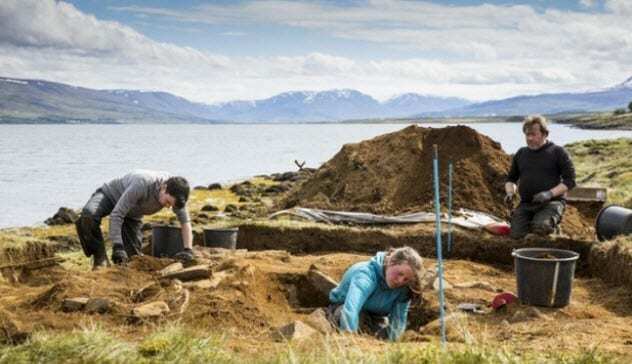 Another ship discovery was made off the coast of Iceland between a village called Hjalteyri and the small town of Akureyri. It was part of a later burial, not all of them being ship burials. While the find hasn’t been hit by grave robbers yet—which is unfortunately all too common when it comes to burials from long ago—the ocean had eroded the site. There were several burial mounds and, at least originally, one containing a ship. But further excavation located another ship burial near the site. These are believed to have been from the Viking Age. At this site, half of a ship was uncovered, the other half having been eroded by time and the ocean. Also located just beneath the surface were the bones of a man and a sword. 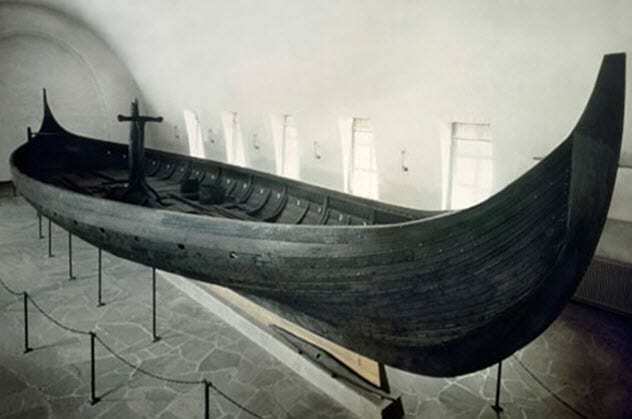 Another burial ship from Norway dates back to around AD 900. 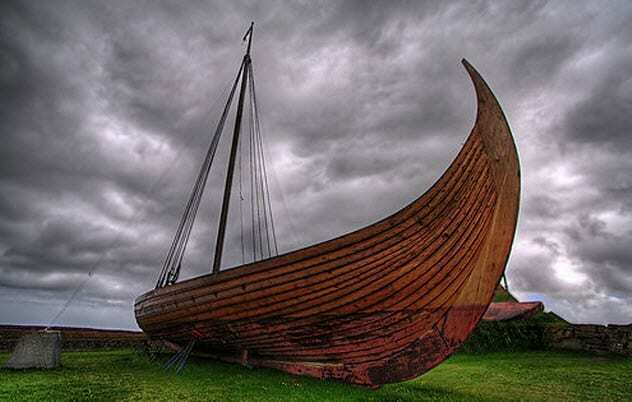 Called the Gokstad ship, it is now featured at the Viking Ship Museum in Oslo, Norway. The vessel could be both sailed and rowed, with each side of the ship containing 16 holes for rowing oars. Thus, up to 32 people could row the ship at a time. Sometimes, the Germanic peoples constructed a ship painstakingly for a burial. Other times, they used vessels already on hand that had seen travel. When it was found, the Gokstad ship had 32 shields affixed to it. The ship was part of the larger Gokstad Burial, where someone who appeared to be of serious social significance was buried. The skeleton was that of a large, powerful man in his forties who apparently died in battle over 1,000 years ago. The unidentified man was buried with a ton of gifts, and we do know that he likely died of a knife wound to his right thigh. 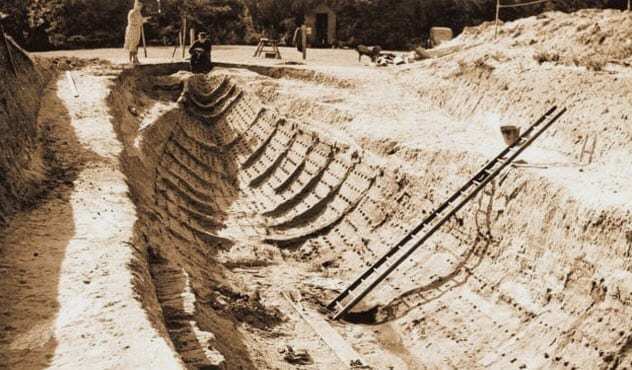 The original custom of ship burial didn’t start with just wooden ships or retired naval vessels but with stone ships, symbolic vessels constructed to surround a socially important figure who died. Sometimes, they served as a place for a mass burial instead. 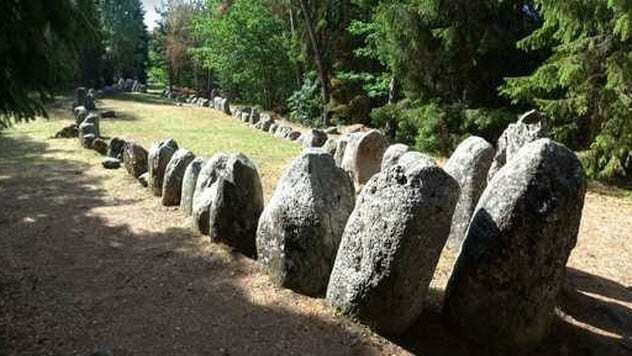 These stones would be set up, often similar to those at Stonehenge, in the shape of a ship. The dead would be placed inside. Three such symbolic stone ships were uncovered in Gotland, Sweden, a small island where many gravesites have been uncovered. There, the main ship pointed to a megalithic tomb structure for a mass burial. Before individual ships were built for cremation, these symbolic stone ships served as monuments for the dead and are suggestive of the Germanic belief in the afterlife. The ships are still on display today and draw quite a number of tourists. 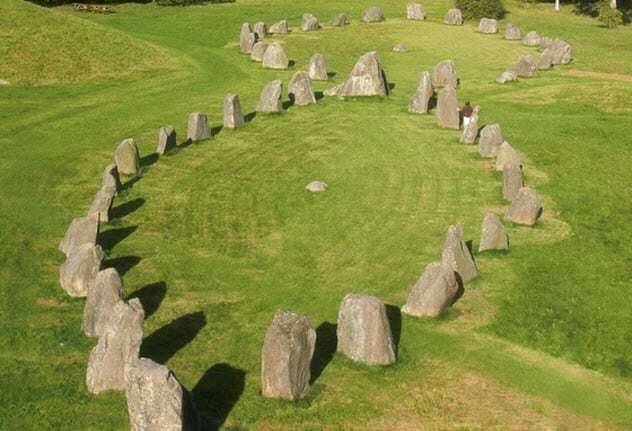 The site located at Anundshog is the largest burial mound in Sweden at 9 meters (30 ft) high and 60 meters (200 ft) in diameter. It also contains one such symbolic stone ship. 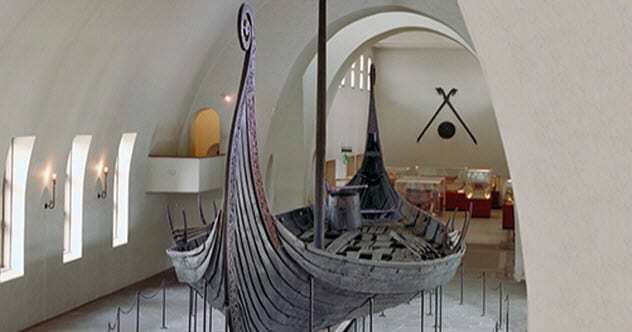 Although the exact date of ship construction and the burials within is unknown, this is evidence that the religious rite of ship burials took place before the so-called Viking Age. Gifts of jewels and other items were also placed in this mass grave. Evidence of food was found as well, meaning that the people who constructed the site were attempting to give food to their friends and loved ones on their journey to the afterlife. 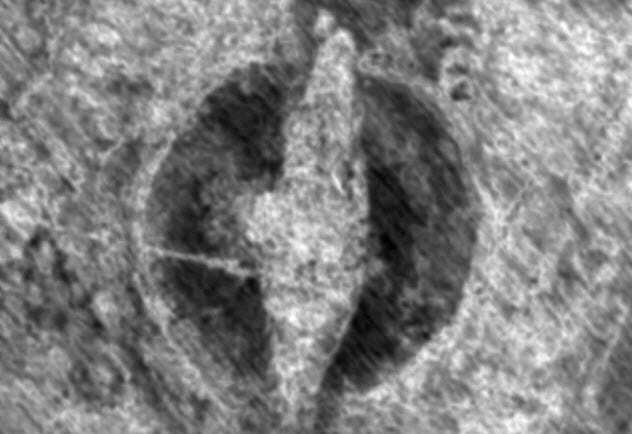 A similar ship burial was found in Kallandso, Sweden, from the pre-Viking era (presumably from the seventh century). This ship is believed to have come from the Vendel era (550–793) and contained burial gifts and dead animals like the others did. This vessel was likely set on fire and used as a funeral pyre to cremate the dead person being honored at the ceremony well over 1,000 years ago. A recent discovery near the Norwegian capital of Oslo may prove to be the largest burial ship ever found. Although it has only been detected by technology, archaeologists know it’s there. It is approximately 20 meters (65 ft) long, which is a rare size for such a vessel. It is believed that the ship definitely housed a dead king or a queen. Currently, there are no plans to excavate the site, but time will tell. It is presumed that the ship is not alone in the middle of Norwegian farmland but part of a larger burial site. 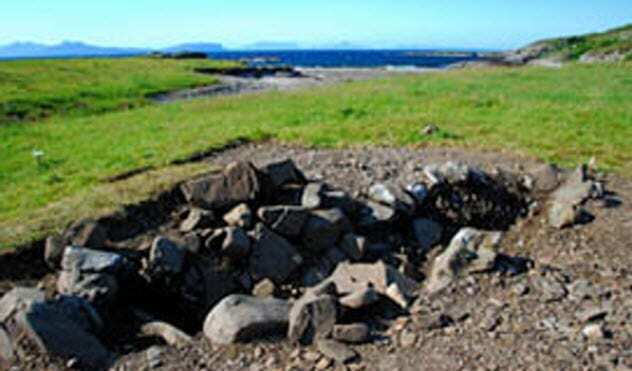 Another unusual find was the site of a burial ship that’s believed to be over 1,000 years old. The vessel only measured 5 meters (16 ft) long, which is a small ship for traveling. Still, the person entombed there was probably an important and well-traveled warrior. Of great archaeological and historical value, a well-preserved shield, axe, tip of a drinking horn, and iron rivets were also found. These items were the most suggestive that a ship once lay at the site. Artifacts buried there came from as far away as Norway and Ireland, which is why it is believed that the remains belonged to a traveled soldier who had been experienced in combat. 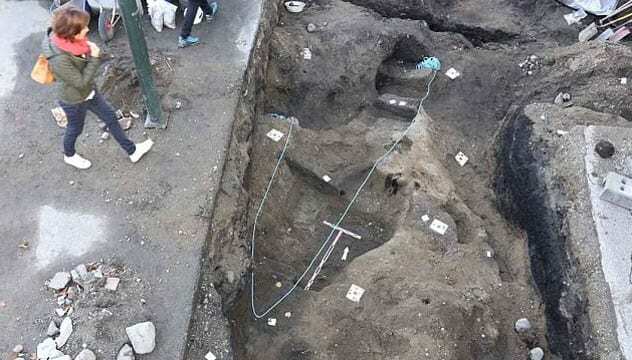 Of course, the body was found and probably belonged to a Viking chieftain. Sutton Hoo was the Anglo-Saxon site of a ship burial near Suffolk, England. Consisting of 19 or 20 different burial mounds, Sutton Hoo is one of the biggest archaeological finds related to the Germanic peoples. Containing all sorts of rare and telling discoveries, the Sutton Hoo site has shown us much of what we know about the Anglo-Saxon peoples and how they lived. Gold and silver grave goods came from as far away as the Byzantine Empire, which suggests that a person of special significance was honored. Curiously, a body was never discovered at the Sutton Hoo site. Nevertheless, the sheer amount of goods revealed by the excavation makes this one of the most massive and important finds related to ship burials. It also shows that this ancient Germanic practice spread much further than the Viking world. A rare find, the Oseberg ship was discovered in Norway in 1903 when a farmer dug into a burial ground and uncovered a portion of a ship. An archaeological team immediately did some initial digging that autumn. But to best preserve the ship, they delayed the rest of the excavation until the following summer when the weather was more favorable. The Oseberg ship may be the most intact burial vessel we have. It currently resides at the Museum of Cultural History in Oslo, Norway. Whoever constructed the ship went through a long and painstaking process of design and creation to forge this beautiful masterpiece, suggesting that the contents inside were quite significant. In its day, the Oseberg ship had been pulled ashore and used in the burial of two women. Its contents were astonishing. Animal heads, clothing, tools, utensils, six dogs, 15 horses, and two cows were all buried with the two women in one ship. This shows the painstaking care that went into the religious rites of burial for the men—and women—of that time. I like to write about dark stuff, history, philosophy, and death. Read eerie tales of unusual ships on 10 Sunken Ships With Unusual Stories To Tell and 10 Real-Life Ghost Ships No One Can Explain.